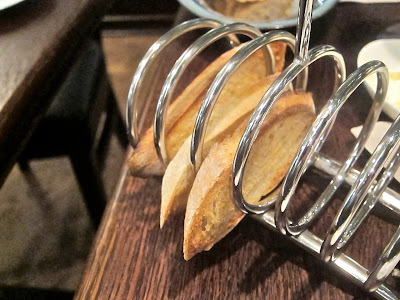 One of the things that gets me to try a new restaurant is when it's got some buzz. But what is buzz and how do you get it? For me, Prague feels like a small town when it comes to serious media coverage of restaurants. 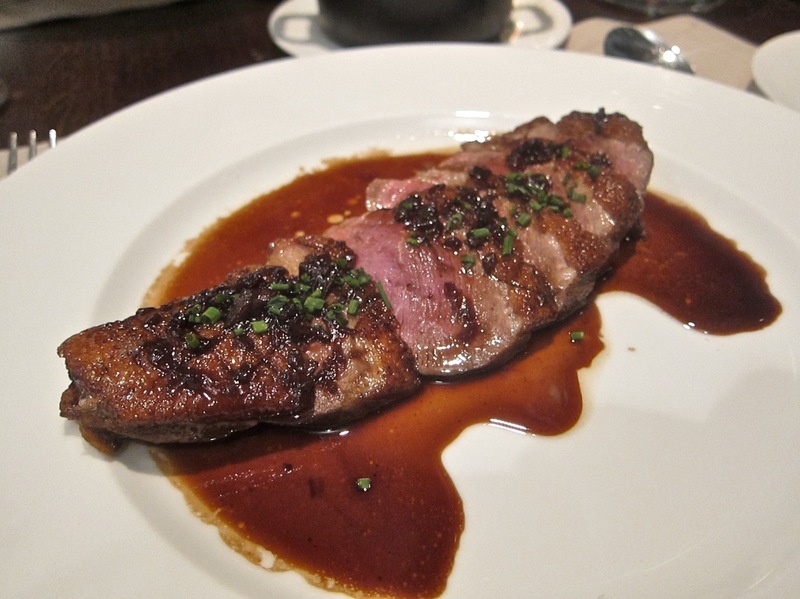 There are only two people writing regularly about restaurants in English, which I think is hardly befitting of an up and coming European capital. Of course, there are more critics writing in Czech, and I follow some of those. But when it comes to serious write-ups, it still doesn't feel like there are enough out there. Not for me, at least. So, it's a low threshold, but when I see raves from at least two friends or media sources I trust, I consider that buzz. 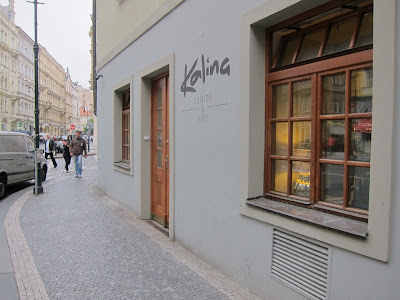 Kalina, a relatively new restaurant a few steps from Old Town Square, has got some buzz. 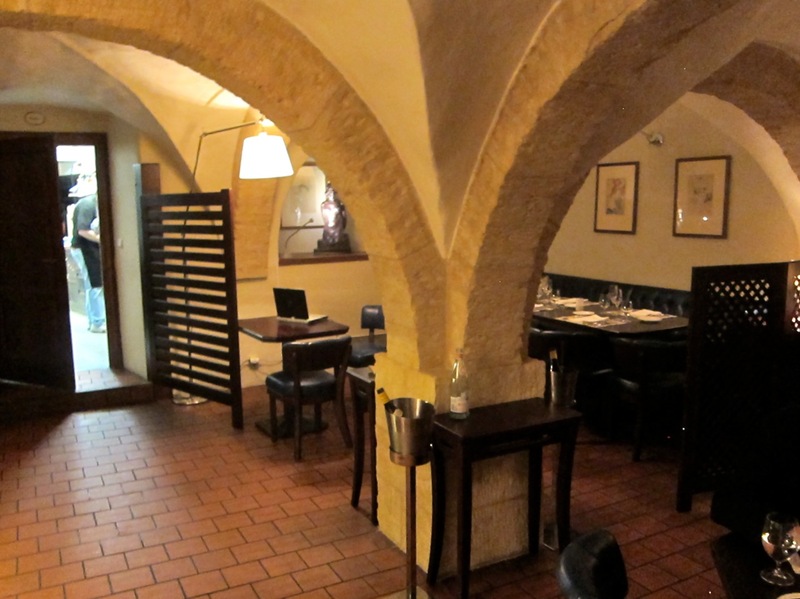 The primarily French restaurant is in an interesting space divided into small sections with vaulted ceilings. As you enter, you see a small bar and the chalkboard with the daily specials. It looks a bit cramped. There's another small front section on the other side of a wall. Space is even tighter in there. Diners sit almost elbow to elbow. That's where I sat on both visits. There was no smoking. Their back dining room feels just a little more spacious. I thought it interesting that I did not hear any music played in the restaurant. After sitting down, I declined the waiter's offer of an apéritif or glass of champagne. 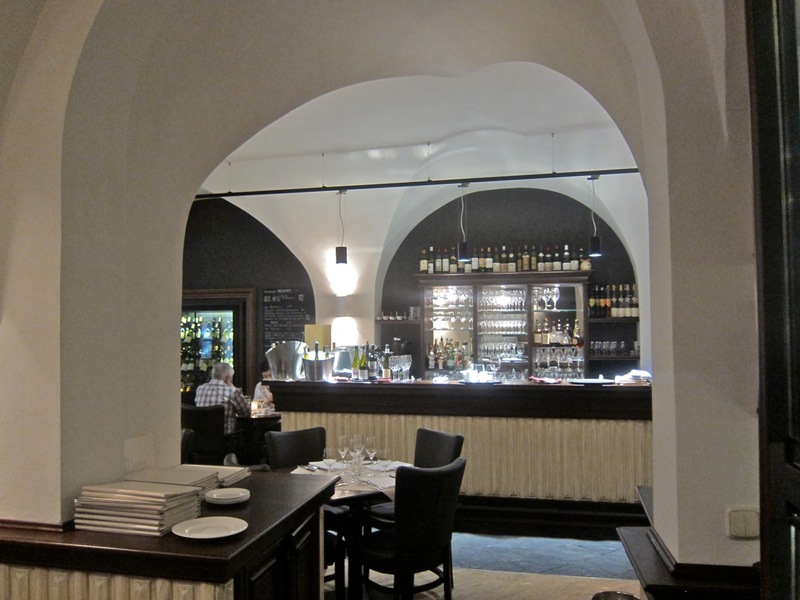 A glance at the wine list confirmed another piece of news that traveled fast: the vast majority of their wines are over 1000 CZK. My friend D and I decided to have just a glass. D tried the 2011 Jean Claude Bessin Chablis Vieilles Vignes (165 CZK). It was cool, light, with nice balance. It met our expectations. I had the 2009 Lucien Crochet Sancerre Rouge (180 CZK). We both thought it too acidic for our tastes. The pour for their wines by the glass is just .125 liter. We also had a .75 liter bottle of Badoit mineral water. The waiter brought a bread basket with rather ordinary French baguette slices and Czech rye bread. Then there was an amuse bouche. 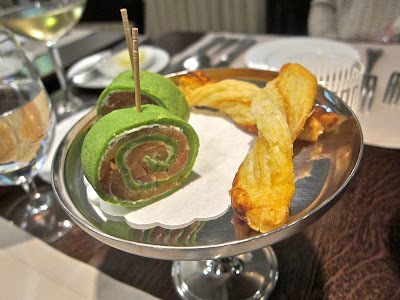 It was smoked salmon and crème fraîche wrapped in a parsley pancake with Parmesan twists on the side. They were nice little bites, but nothing too eye-opening. For a starter, D got the Brittany blue lobster with green peas, lemon cream, and caviar (490 CZK). It wasn't very large, but we found it very enjoyable. The lobster was properly cooked and went well with the citrus notes underneath. What we both found intriguing was the creamy block of green pea purée. 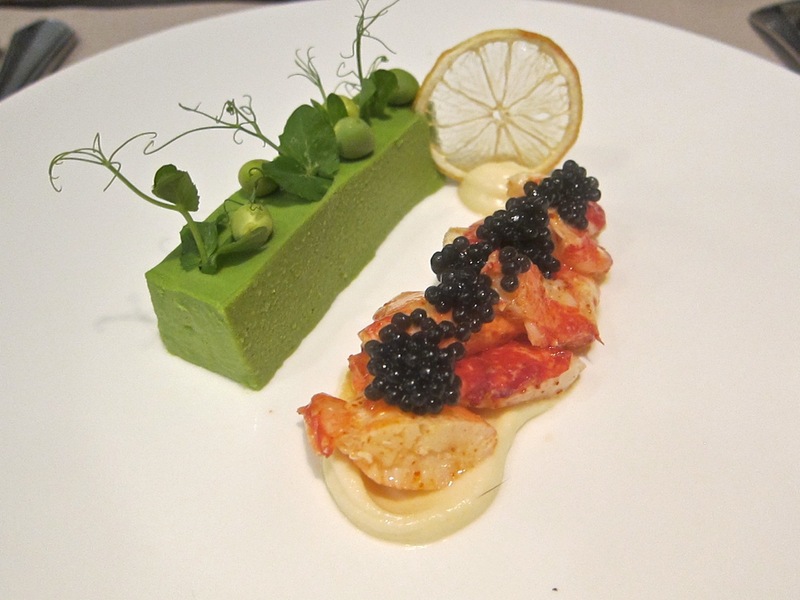 When combined with the fresh peas on top, the essence of the flavor and the texture was something different and special. It was slightly on the salty side for me. I had the lightly smoked veal tartar with 63° egg (250 CZK). The presentation was impressive, with the dish coming out under glass filled with smoke. The egg, which was just the yolk, was cooked at 63° Celcius, which allows it to hold its form and yet not solidify at all. 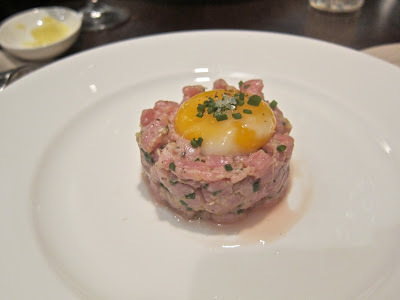 A touch of the fork sends the yolk running into the veal. There was a hint of spicy heat in there, with salt and pepper bringing up the flavor of the raw meat. The meat was roughly chopped, which I like. My only critique here is that I expected the raw veal to be more tender. 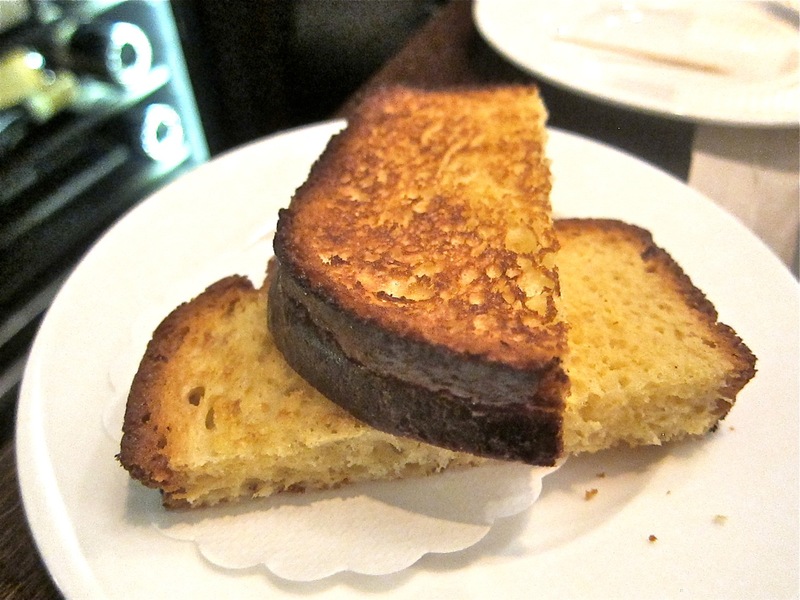 It comes with a few slices of toasted bread on the side. My main course was the grilled duck breast (290 CZK). This was pretty much perfect. I moved it slightly to reveal the pinkness of the medium rare preparation. The delightfully crisp skin had a thin layer of delicious fat underneath. That gave way to the tender breast meat. The red wine sauce was top notch. Lightly sweet, the flavor of the fermented grapes came through, clear and true. 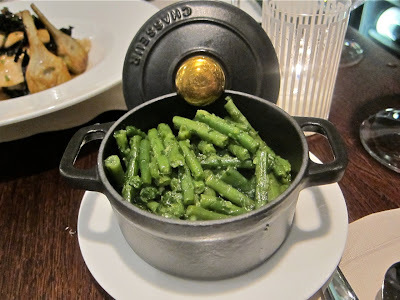 I wanted to try the mashed potatoes à la Joël Robuchon, but the waiter steered me toward the green beans (80 CZK). They were fresh, bright, and snappy. And there was significant amount of liquefied garlic butter in that pot. It might be too much for some. 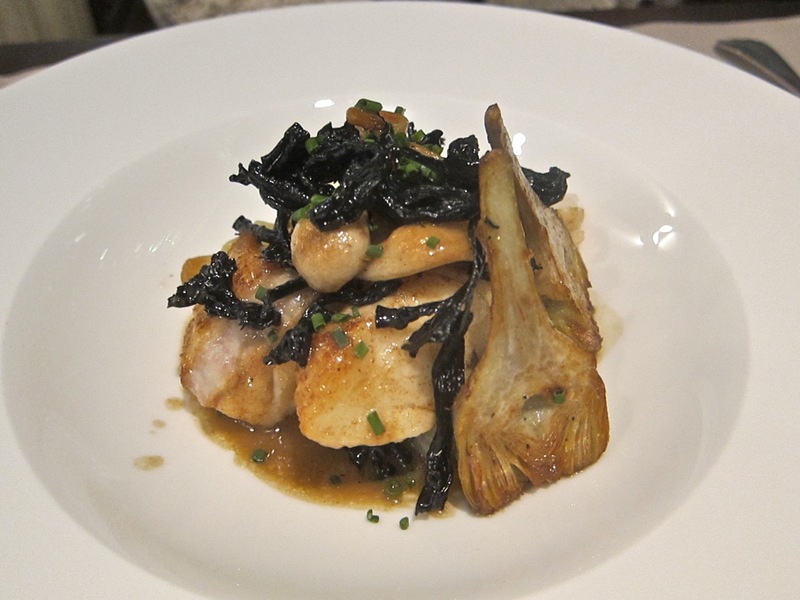 D had the daily special: wild turbot with grilled artichoke. We agreed that this, top to bottom, was true excellence. The white, flaky filet was one of the best tasting and expertly prepared pieces of fish I've had in a long time. The artichoke was the real, fresh deal. It was topped with "black mushrooms" and sat on diced new potatoes in a shallow pool of mushroom butter. The whole thing was a luxurious, but be aware, so was the price. I hadn't checked the chalkboard, but at the end of the meal, I saw that this piece of pleasure checked in at 725 CZK. We both went for dessert. D ordered the strawberry and asparagus strudel (180 CZK). Yes, asparagus. It was served warm with lemon whipped cream on the side. D liked it, but I can't say I did. I found the crust a little dry and chewy. I didn't really notice the taste of the asparagus when everything was mixed together on the fork. 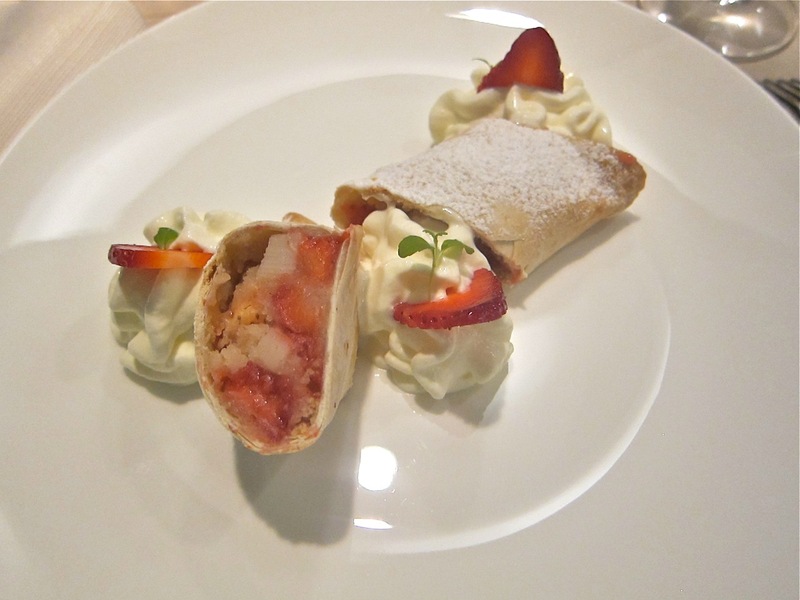 But when I pulled a piece out and had it with just the strawberry, the flavors clashed too much for me. I got the griottes au chocolat (210 CZK). 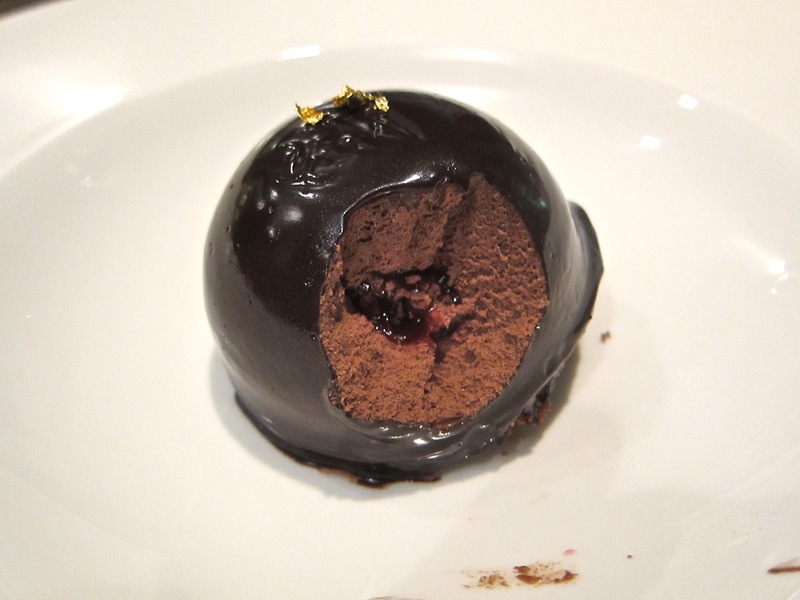 In simple terms, this was like a dark-chocolate coated chocolate mousse with wild cherries in the center, sitting on a thin chocolate cake on top of more wild cherries. In simpler terms, I liked it. Desserts are offered with pairings of different spirits. For a price, of course. The bill for this meal with just two small glasses of wine was 2840 CZK before tip. I had seen the menu before I went, and I had figured the dinner would be in the 2000 CZK range, so it sailed above my estimate. Service was generally efficient and friendly. 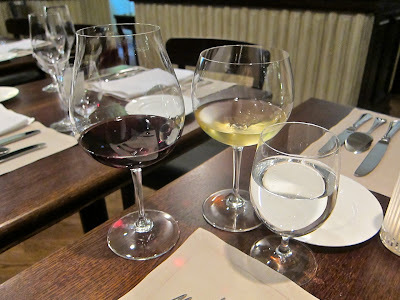 There was one small mix up when we ordered different glasses of wine and the waiter thought we wanted two glasses of each in separate courses. I liked the restaurant enough that I wanted to come back for a second visit with my friend Z. The amuse bouche and bread were pretty much the same. We both had a glass of 2011 Prieure de Montezargues Tavel Rosé (140 CZK each). 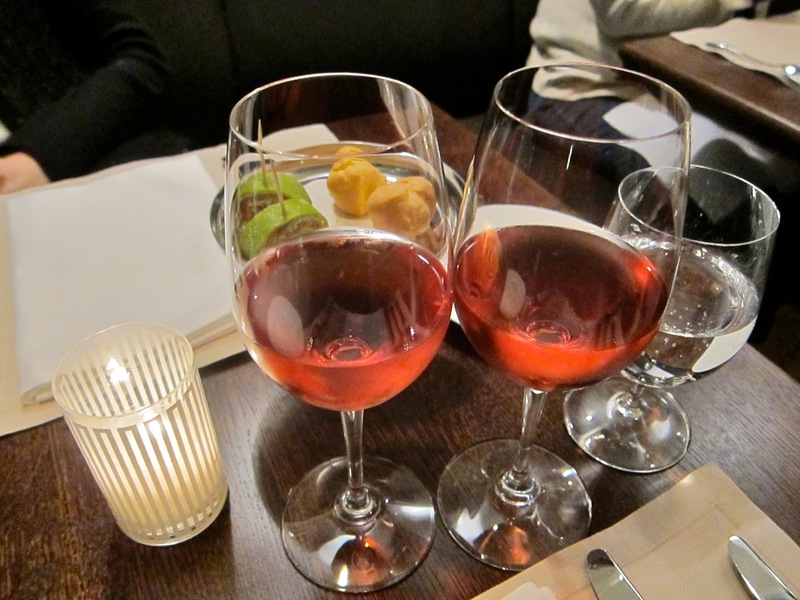 The wine was light, refreshing, with enough color and character to keep it interesting. 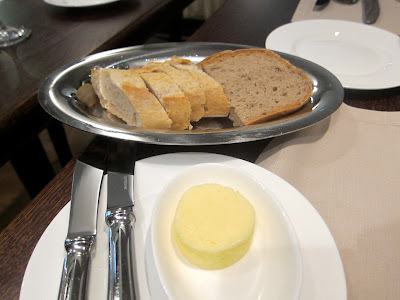 For a starter this time, Z had the asparagus soup (160 CZK). Again, the presentation was something special. The bowl was presented with just diced asparagus at the bottom, along with a 63° egg yolk in the center. 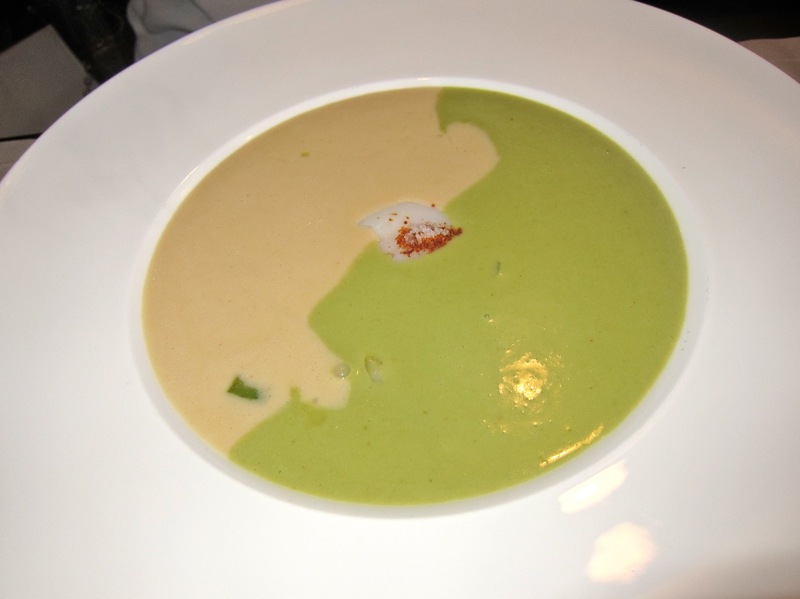 Then, the waiter poured pitchers of green and white asparagus soup on each side, creating a bi-colored effect. 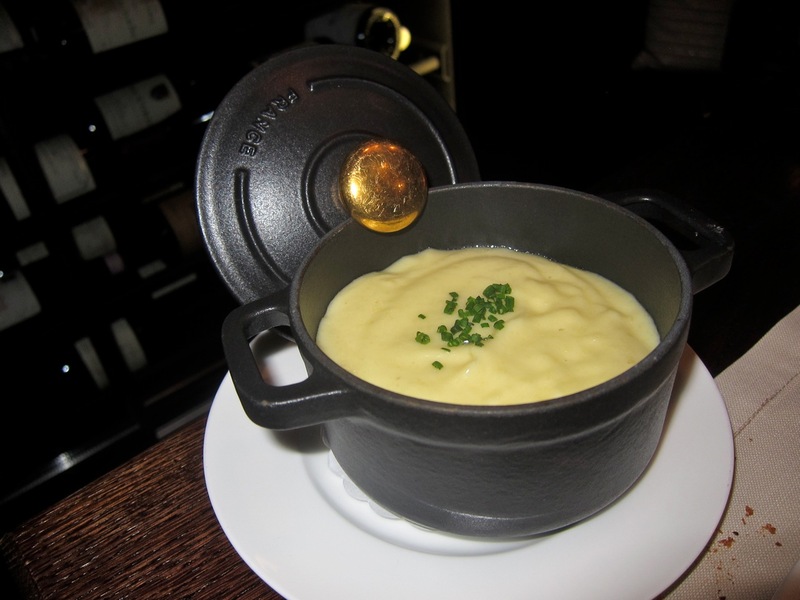 The silky smooth soup was perfectly balanced with the rich yolk and bursting bites of asparagus. It tasted as good as it looked. 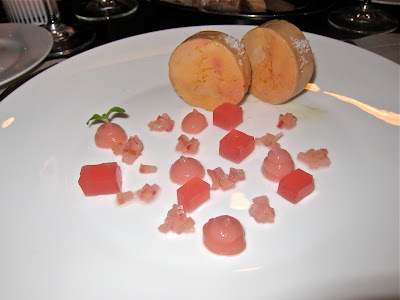 I went for the duck foie gras "terrine," which really looked more like a torchon (390 CZK). The plate was decorated with three types of rhubarb -- pureed, jellied, and chopped. It was a fine, sweet, and tangy complement to the buttery liver. It came with a toasted slice of quality brioche on the side. 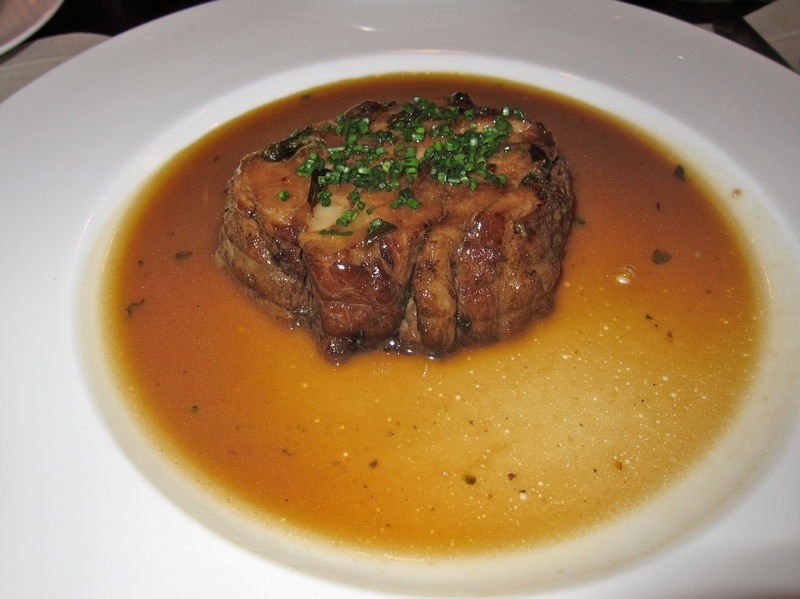 As a main course, I selected the braised lamb shoulder cooked in its own juices (280 CZK). It was competently done, just slightly fatty, with plenty of lamb flavor in the meat and the salty gravy. By itself, it was not bad, but nothing to write home about. This time, I got the potato purée on the side. It could not be more rich, buttery, and delicious. When mixed with the lamb, it elevated the dish to a higher, more decadent level. I've never had better. 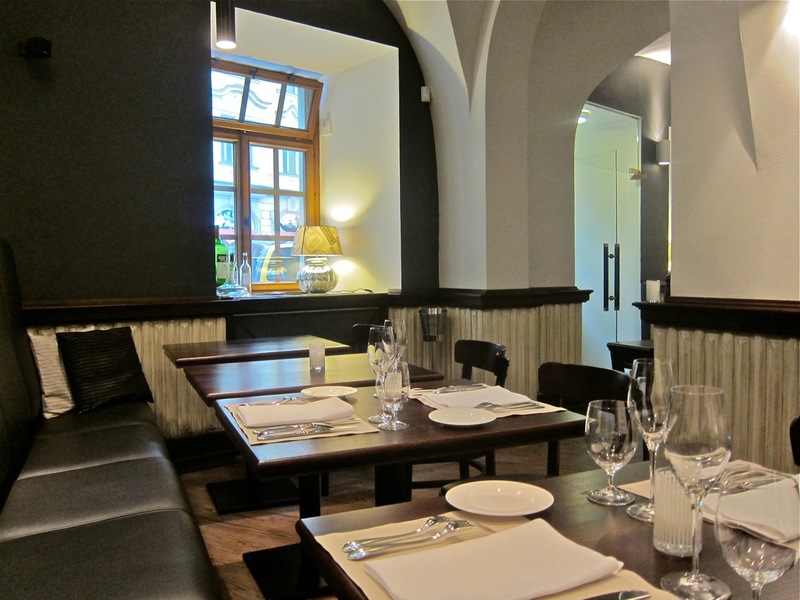 Z took another special, the red snapper (695 CZK). This was served over a stewed tomato sauce and a grilled polenta that, despite the load it carried, retained both its crisp exterior and its smooth interior. 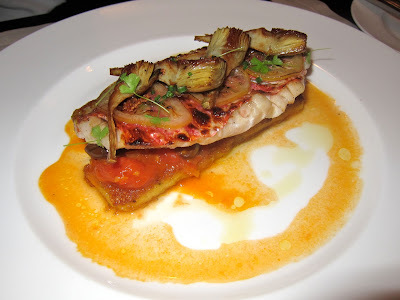 On top of the fresh and flavorful fish, there was grilled artichokes and thinly sliced candied lemon. It added up to a successfully creative combination. I loved it. 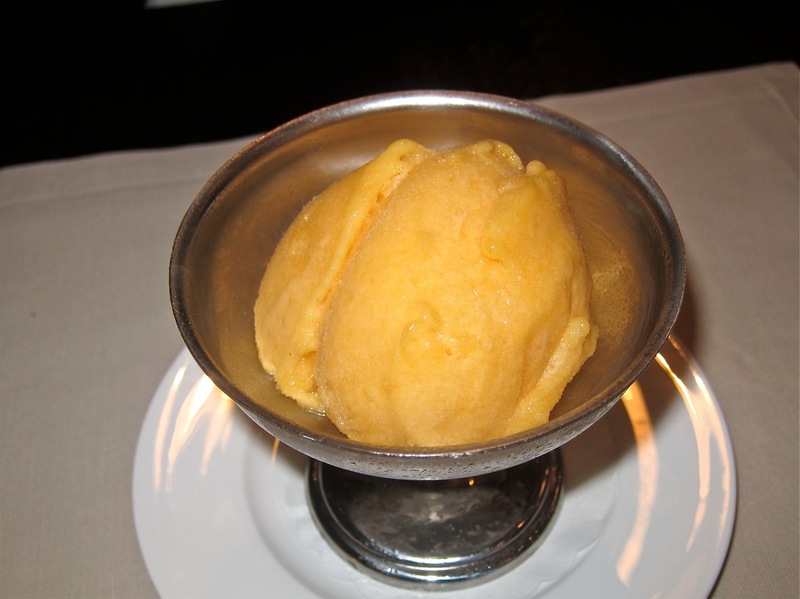 We were both full, so we shared a dish of apricot sorbet (90 CZK). The intense sweet and sour flavors of the fruit made for a highly recommended way to end a meal. Refreshing. 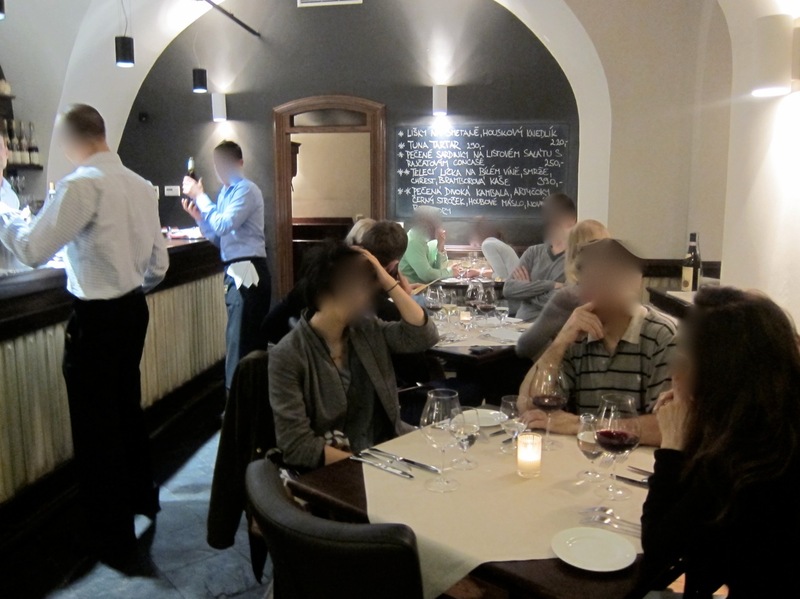 The bill for this meal was 2110 CZK without tip. Again the service was good except for another minor wine snafu when we ordered glasses of rosé and the waiter thought we wanted rosé champagne. Note that the menu changes regularly, so many of the dishes we tried may not be on offer when you visit. I have to say, I'm very conflicted in my feelings about this restaurant. There are a number off issues that hold me back from a full-throated rave. They are proud of the quality of their wines on offer, but there were no full-size bottles in the 500 CZK range. I think it's a missed opportunity. I think they'd sell more to people who'd rather spend a little less, while still hoping for something drinkable. The restaurant was too warm. We were removing all the clothing we could while remaining respectable and still didn't feel comfortable. I'm torn about their fish specials. If I'd seen the price in advance the first time, I might not have ordered it. But I enjoyed both of them greatly, so I can't say I have regrets. I do wish it wasn't such a splurge. I've rationalized that those price points are not unheard of in New York, Paris, and even a few other places in Prague. There are some good values on the menu, considering the quality, but you have to be really careful how and what you order to keep your tab out of the stratosphere. Above all -- and there is not much they can do about this -- most tables were uncomfortably close together. Saying we were cheek by jowl could almost be taken literally. On a Thursday, the place was full. On Saturday night, it was about half full, but we still had people almost in our laps. During the first meal, I was having a personal conversation while praying that the tourists at the next table didn't speak English too well. On the second visit, I was talking about the ins and outs of writing about restaurants and hoping the people at the next table were tourists. They weren't. "Are you the Czech Please person," the friendly woman asked at the end of the meal. "Yes," I confessed, my poker face eluding me. Luckily, she was very gracious. Considering some hate mail I've gotten, it could have turned out much worse. My advice is this: if you love good food prepared by a talented chef, give it a try. Maybe I was unlucky with my table. You might find the restaurant more comfortable than I did. If so, it would be well worth your time and, depending on how much you earn, your money. Wonderful post! The food, presentation and decor looks great!